We begin the long process of becoming weaker. After age of 30, the body does not receive the necessary stimulus to trigger muscle growth and the slow process of muscle wasting begins. This muscle loss hastens the degenerative processes and conditions that characterize the dreaded aging process. When we reach our mid-twenties, without physical “work” to maintain strength, the body loses about ½ pound of muscle tissue per year. After age 50 this doubles. When you do the math it’s not a pretty situation. This new muscle to fat ratio (our body composition) siphons away our strength and weakens our entire body systems. Basically we are living a life for which we are not optimally designed. We were not designed to lead a sedentary lifestyle even if our new modern “desk” jobs demand it. We were meant for vigorous physical activity just as our early ancestors were characterized by hard physical labor. 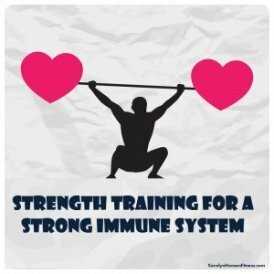 All this lack of physical exercise and muscle loss eventually leads to the immune system weakening leaving the body exposed to life threatening disease and illness. Studies show that regular strength training exercise provides long-term immune protection and cause adaptations that allow the body to withstand training stress and recover from it more efficiently. You are in effect building a protective shield in the body against disease. The human body is a “use it or lose it” machine. It is the loss of precious muscles accompanied by an increase in body fat that puts extra strain on all systems. Increased body fat changes the healthy balance of fats in the blood leading to heart attacks and strokes, altering sugar metabolism and increasing the risk of obesity and diabetes. Weak, flabby muscles cannot help the heart push oxygen and nutrient rich blood around the body so all cells, tissues and organs suffer. Every part of your being is impacted through lack of proper exercise including not only physical health but mental and emotional health as well…meaning your moods, anxiety levels, stress levels and ultimately your happiness and satisfaction in life.